Bristorm are specialists in the design and manufacture of Hostile Vehicle Mitigation systems suitable for securing large high-profile sites, perimeters and borders. Over recent years, their product quality and product performance has been recognised worldwide and they have developed a respected brand across the UK and the Middle East. Bristorm have innovated further to ensure their products are suitable for all commercial markets. 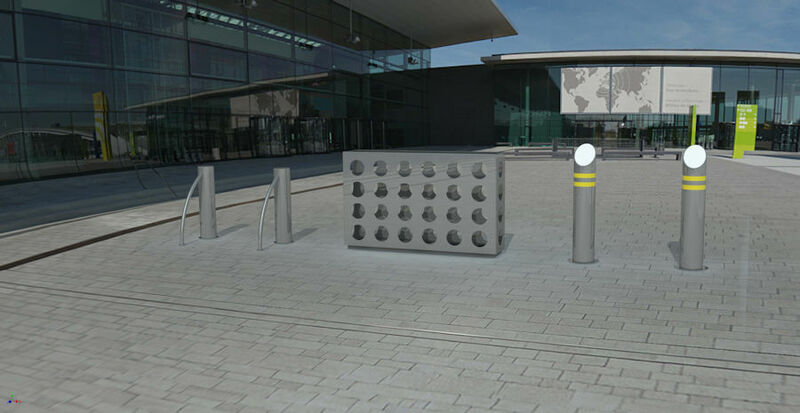 With the PAS 68 performance at the heart, their street furniture solutions will complement the architectural landscape meaning sophisticated yet appropriate anti-vehicle solutions can be used to protect asset and pedestrians throughout. These novel ‘Bristorm’ solutions have experienced unrivalled levels of success making them cost-effective solutions for securing front of house and site perimeters from the perceived threat. The Bristorm HVM Street Furniture range can be installed to safeguard crowded locations, high profile sites, city centres, the street scene and all industrial and commercial developments around the UK. Bristorm are also able to offer high security solutions with zero penetration and shallow mount; all Bristorm Hostile Vehicle Mitigation solutions are tested and rated at MIRA and TRL to BSI PAS 68, IWA 14 and ASTM F2656. Bristorm is the security division of Hill and Smith Limited whose history dates back to 1824. Hill and Smith have unprecedented experience in the development of highway crash barriers and infrastructure products and over the years have innovated to meet the demands of the changing environment. Hill and Smith Limited are members of the Hill and Smith Holdings (PLC) Infrastructure Products Group; the international group has subsidiary companies across the world each equally renowned for maintaining the group’s efforts in achieving high quality and high product performance throughout. Being a member of the Hill & Smith Holdings PLC results in their stringent compliance with all necessary ISO certifications, including: ISO 9001:2008, ISO 14001:2004, PAS 99:2012 and OHSAS 19001:2007. Visit the Bristorm website to gain quality information on all their hostile vehicle mitigation systems and how they should best be applied. You can also contact a member of their team for further guidance.